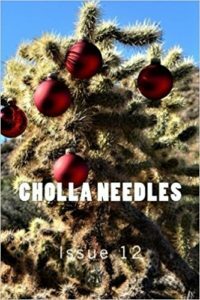 The latest issue of Cholla Needles is out, and I’m thrilled to have 3 short pieces included. Buy it here for just 5 American dollars. 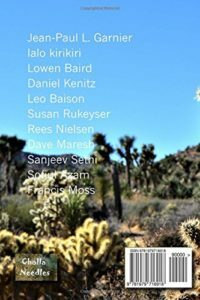 Cholla Needles Press started earlier this year and has published books in addition to the magazine, which is now on Issue 12, so that gives you an idea of the literary energy here in Joshua Tree, CA. They hold monthly readings on an outdoor stage behind local bookstore Space Cowboy Books, drawing together a vibrant and welcoming crowd that includes many talented local writers and others who regularly come through to visit and read. These are my first publications since moving out here. They were all written in this ecstatic creative flurry I’ve happily and gratefully surrendered to since I finally unpacked my boxes. There is something about this place: the expanse, the silence, the glorious sunshine. My 3 pieces are: “About a Month In The Desert,” flash CNF about my experience moving to the desert from someplace very different; “HUMAN | NATURE,” micro prose inspired by the view from the mineral-encrusted “rainbow” terraces, or cliffs, of Thermopolis, WY; and a flash piece called “1 table, 2 chairs: ugly,” part of a series I’m working on called SWAP/MEET (virtual). There is so much good work within these pages and I am honored to have mine included. And I’m thrilled to see my name against the brilliant blue sky that is making me a writer again, at last.